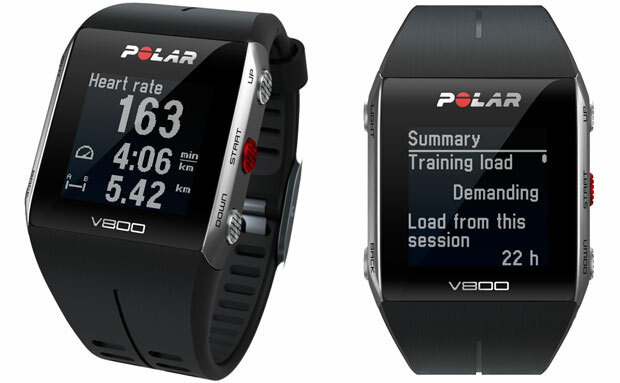 Summary: The Polar V800 is true fitness finesse and comes with a wealth of sporting features! 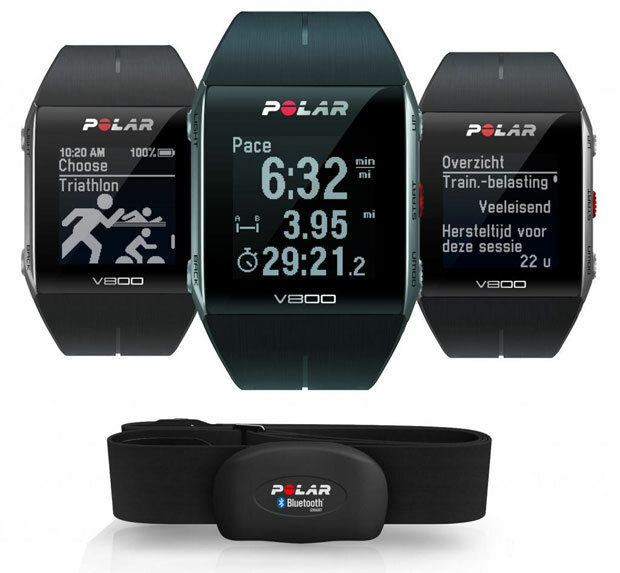 The Polar V800 is a high end fitness tracker that targets the sporting professional, however it’s also a product that can be used by anyone, especially if you want to monitor your fitness and health. It even boasts some smart watch features such as notifications and even GPS functionality plus a separate heart rate strap. The price of the Polar V800 is $699AUD (April 2016) and although it’s quite pricey, it’s definitely a clever “smart coaching” device and when not being used as a fitness device, it can be setup to display the date, time plus your daily activity goal! 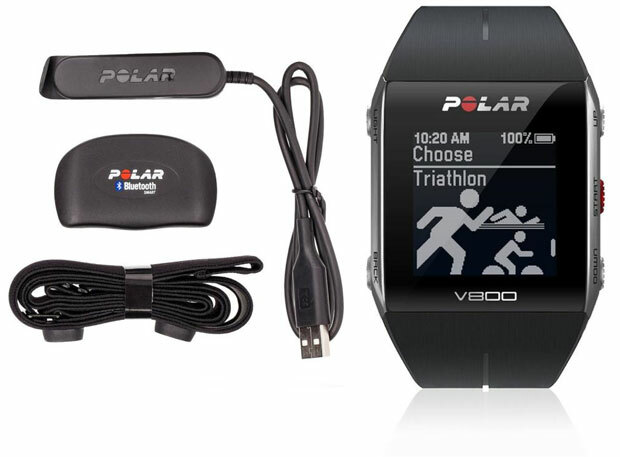 In terms of design, the Polar V800 is a well-designed product, that definitely has that high-end feel to it. For those fashion conscious sports people, the product also comes with a variety of different bands and it also feels quite sturdy compared to some of its competitors and I like the hybrid mix of metal incorporated onto the sides which protects the watch should you accidentally knock it. The weight of the fitness tracker is 70 grams so while it is heavier than some of its competitors, it’s still relatively a light product and the band feels quite sturdy as well. Furthermore, the Polar V800 is waterproof up to 30 metres which means it can be used for swimming and other water sports such as surfing. 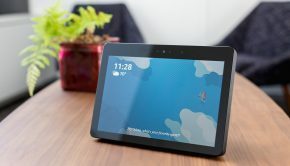 In terms of the display, the unit boasts a 128×128 pixel monochrome display that is quite clear, even in different lighting and thankfully the screen is protected by gorilla glass. Sure it’s not colour but the Polar V800 doesn’t need colour and given that it’s only monochrome, it also doesn’t drain the battery as much either so that’s definitely a great angle. Installation is quite easy and the item does come with a manual. However like all other Bluetooth devices, you first need to download the app and then sync it with your smartphone which only takes a few minutes. 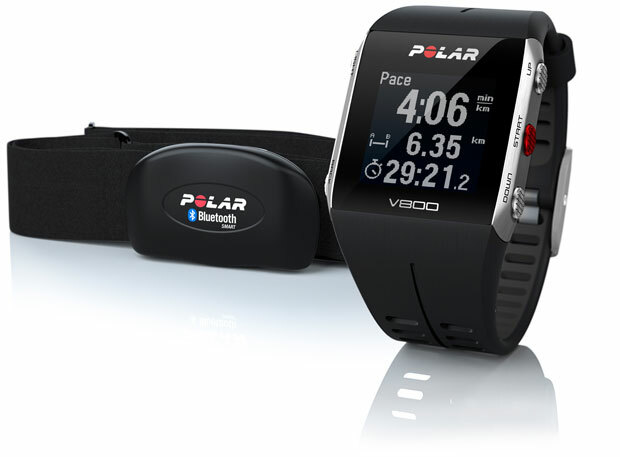 There are also a couple of apps that the Polar V800 is compatible with that include Polar Beat and Polar Flow. Once the V800 is synced with your smartphone, all tracking information is relayed back to the app in order for the user to monitor their fitness. 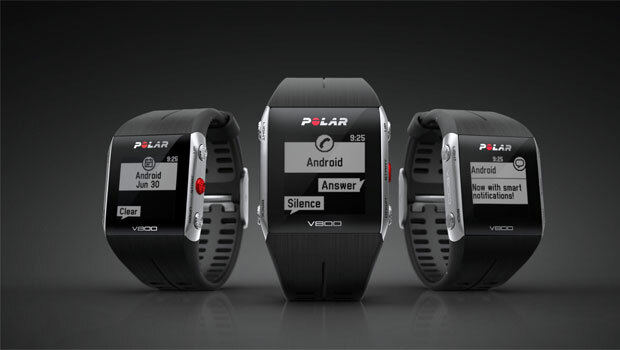 I like the fact that the Polar V800 is geared up to receive alerts from your smartphone for both Android and iOS devices that include emails, SMS, calendar appointments, phone calls and even social media. As mentioned, the V800 measures your activity goal which can be set to three levels which helps you reach your desired goal. It even informs you if you’ve been sitting for too long and you can trace your fitness history through the apps as well. 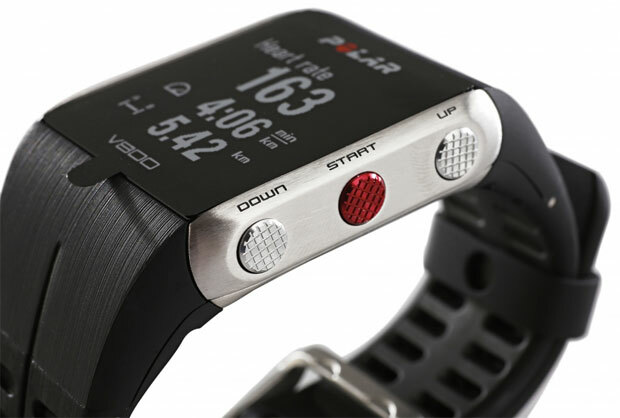 Navigating the watch is done via the buttons with the red button used for starting your workouts. The menu system is quite straight forward on the watch with lots of icons and clear information displayed to the user such as your heart rate, time and the battery metre. 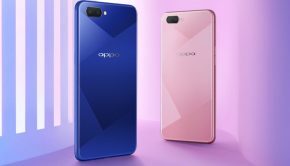 It even has a “favourites” option which allows you to save your regular workout routines that may be running or even doing a specific workout at the gym. After a workout, it will give you a summary such as duration and distance which is quite handy as you don’t have to access it on your smartphone. On the Polar V800 itself, the user can select a variety of sports for it to monitor such as running, cycling and swimming to name a few of the sports. However where the V800 sets itself apart from its competitors is through the GPS capabilities that monitors your routes and does an exceptional job at this, particularly when this information is relayed back to the app on your smartphone. I love seeing all this data relayed back to the smartphone which really helps keep you motivated and the only drawback with the GPS that sometimes it does take up to a minute to establish the signal but thankfully this was few and far between. However my favourite sport mode is cycling as it records speed, altitude and even ascent/descent that with the GPS is far more accurate than standard activity trackers. Those looking at their weight will be pleased to know that the V800 even displays your calories burnt for the day and once again this is linked back to the smartphone app so it can assist with weight loss. I was also impressed at the ability of the V800 to support with you with recovery after exercises and even how much you put into your training session as it does record when you’re having a “easy” day. As mentioned, the Polar V800 comes with a heart rate monitor belt, the H7 which is definitely more accurate than traditional fitness trackers that use LED’s. The heart rate monitor uses Bluetooth and like the main unit itself is also waterproof. Sure it’s a little fiddly to connect sometimes but if you want accuracy, a chest strap is still the way to go, even though wrist activity trackers are getting better… slowly. It can even track your sleep and post workout recovery via the orthostatic test as well. 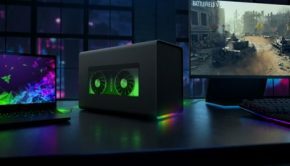 When it comes to charging, the Polar V800 does use its own proprietary connection (aka the “clamp”) which is a little fiddlesome but once you became familiar, it does become second nature. 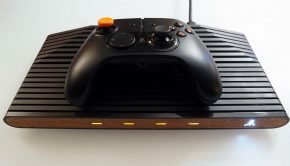 I also like that the charging connection feels sturdy and not as flimsy as other products but it’s still a little strange. 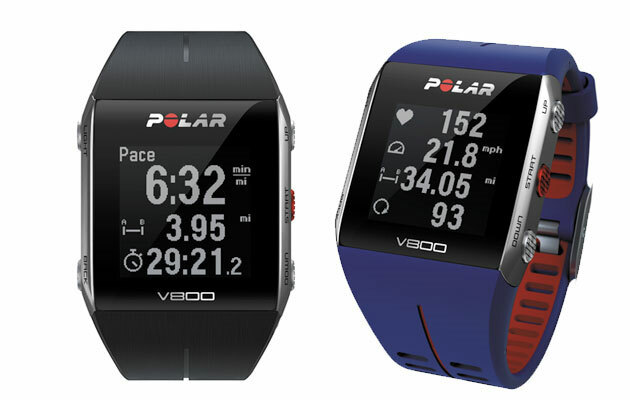 All in all, the Polar V800 is a well made product with a ton of sporting options to help measure your fitness and health. Although the Polar V800 is a few years old now, it’s still quite a powerful fitness tracker, especially if you’re into a higher level of sports. In the end,, it’s a well-designed product that supports an intuitive interface, a decent app and some great high end features, not to mention its water proof which is also another bonus and is great for swimmers or those people wanting to train for a triathlon.